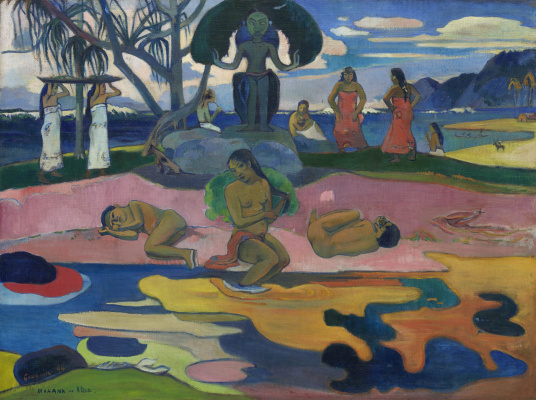 First arrived in Tahiti, Gauguin had a terrible disappointment. 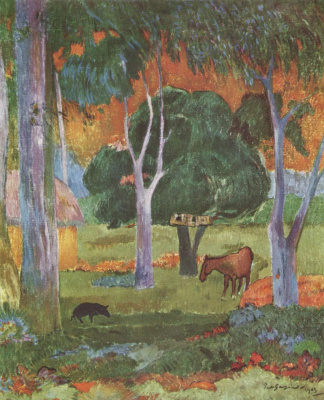 Primitive tropical Paradise of which he dreamed, was hopelessly "tainted" by civilization. 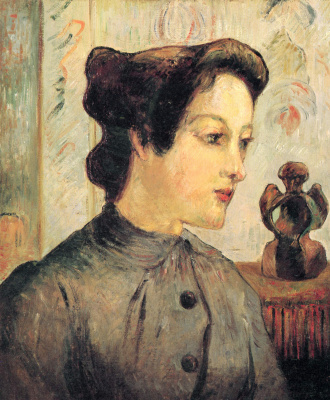 Here were stone houses and paved roads, and beautiful native women mostly wore European dresses and hats. 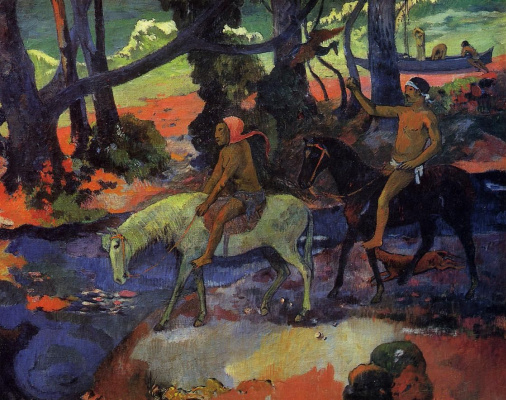 In search of this exotic Gauguin went inland and found what he wanted: the wild, unpretentious huts and most importantly – women don't look like a French woman and ready to date without any obligations. 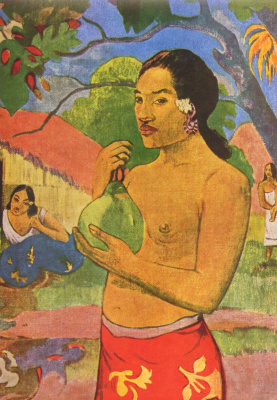 Soon, Gauguin had found his native "wife": her name was Taha Aman and she was only 13 years old. 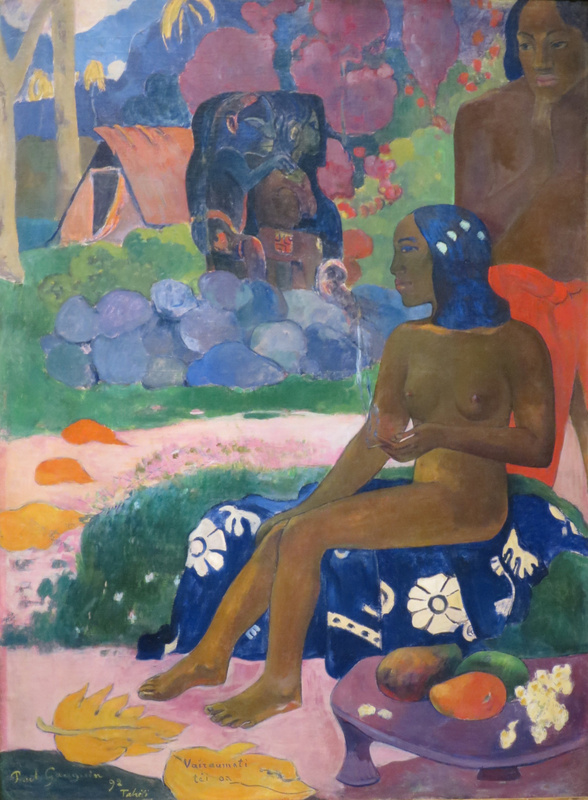 The girl has become a Central part of the legend of a tropical Paradise that Gauguin thought through so thoroughly that even he will believe it. Back in Paris, he entertained friends touching stories about Tenure (as he called the girl) that night told him the local legends and descriptions of religious rituals. 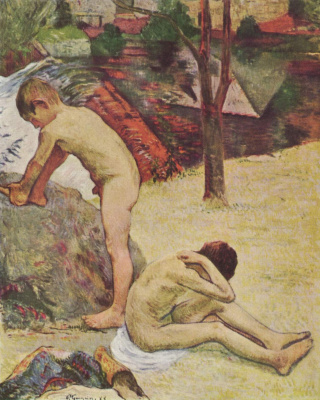 Later, however, Swedish anthropologist Bengt Danielsson denied history, described by Gauguin in his book-journal "Noa Noa". The scientist claimed that Tea Haman just could not know the local legends, in particular, because they are transmitted only between men and kept secret from women. 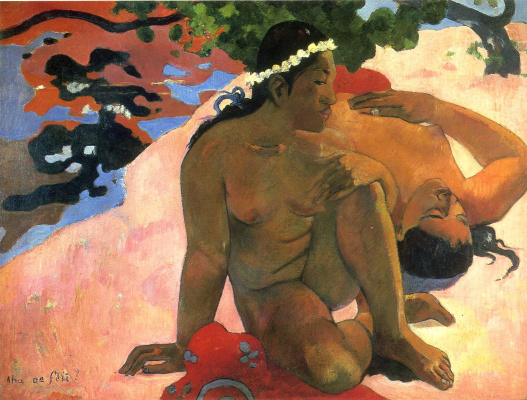 But one of these myths, whether real, invented Tenurei, and even by Gauguin, formed the basis of several paintings written in the first Tahitian period. 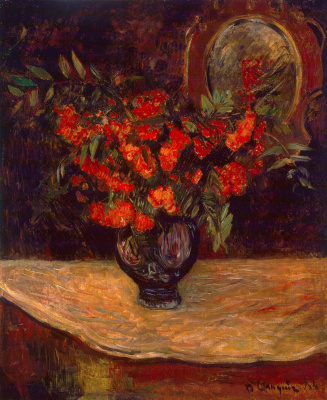 And the most significant of them can be considered a canvas "Her name was Vairaumati". 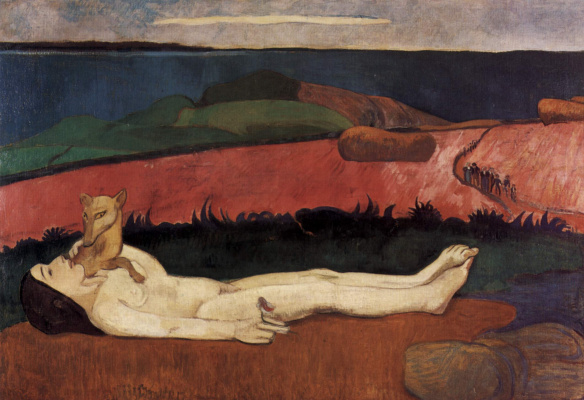 In "Noa Noa," the artist recounts this legend: "Oro, the greatest of gods, one day I decided to choose a friend among mortals... Many days have passed in a vain effort, and he was about to return to heaven when he noticed a young girl, very beautiful. She was tall and stately, the sun shone in the gold of her skin, and in the night her hair was dozing all the mysteries of love. Vairaumati is the name of a girl... Vairaumati prepared for his reception table covered with fruit and a bed of the thin mats and the most luxurious fabrics... After the death of God was taken up into heaven, and Vairaumati she is also ranked among the goddesses". 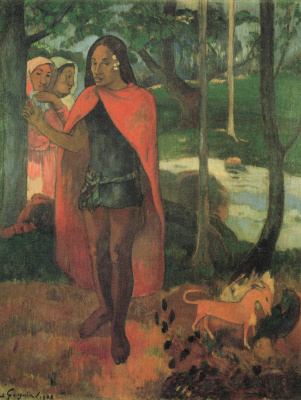 It is possible that the legend of El Oro and Vairaumati Gauguin identified with their own love relationship with Takurou: the misfits "savage" in the end finds love with Golden skin. Although in the end their "tourist" marriage lasted very long. 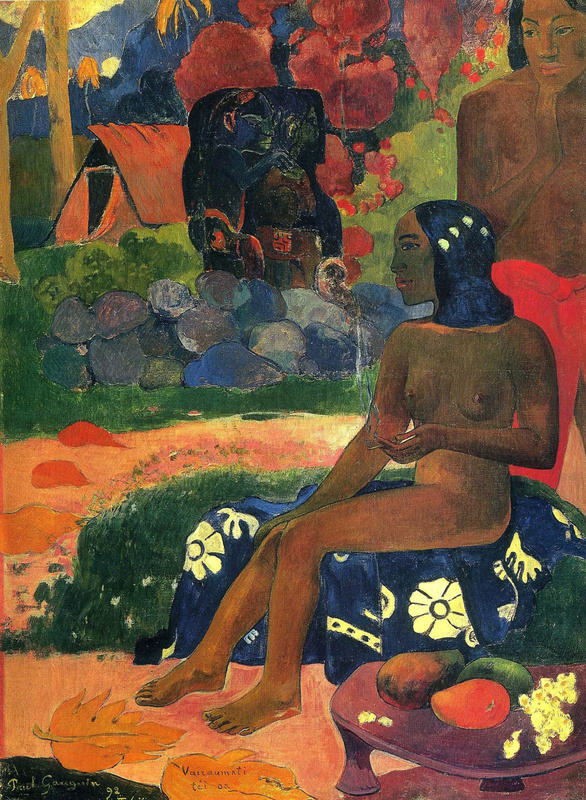 However, the motif of earth goddess can be seen in many paintings of Gauguin's first Tahitian period. And if in the movie "Her name was Vairaumati" you can see the explicit reference to the art of Ancient Egypt, the heroine of "theTahitian Eve"written in the same year, the artist already gives traits Teha Amana.